Devotees of Ganesh pray and seek blessings during the Ganesh Festival at Shri Utthayan Ganesha Temple in Sarika, Nakhon Nayok. To this day, it was one of the most interesting and fun things I've covered in Thailand. 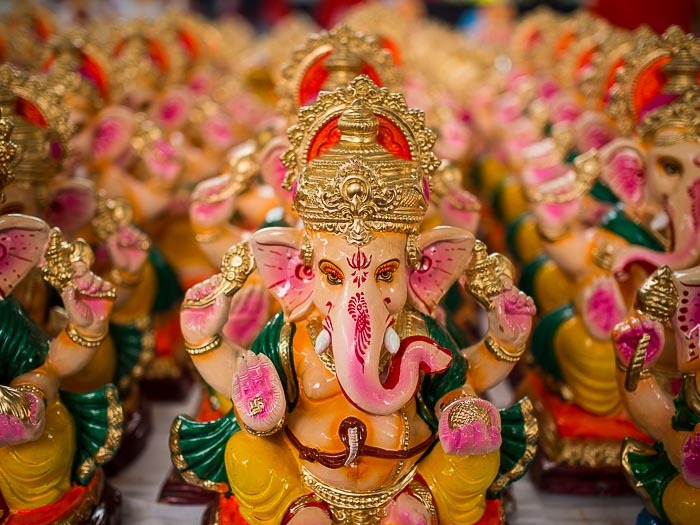 Ganesh is a Hindu God and his birthday is one of the biggest holidays in India but Ganesh is also revered in Buddhist Thailand and his birthday is also celebrated here. Seeking blessings during the Ganesh Festival. After that first experience, covering Ganesh Chaturthi has become a fixture for me. Thais are Buddhists and Ganesh is a Hindu God. Thais are also very tolerant of other religions and incorporate aspects of Hinduism into Thai Buddhism. Ganesh is revered by many Thai Buddhists and there are shrines to the "Overcomer of Obstacles" all over Thailand. Shri Utthayan Ganesha Temple is a Buddhist temple with huge shrines to Ganesh. 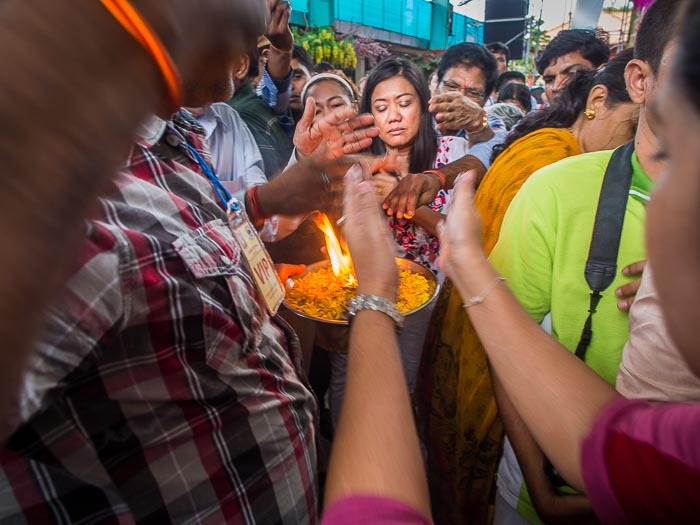 The festival was a real blending of faiths and cultural traditions in Thailand. 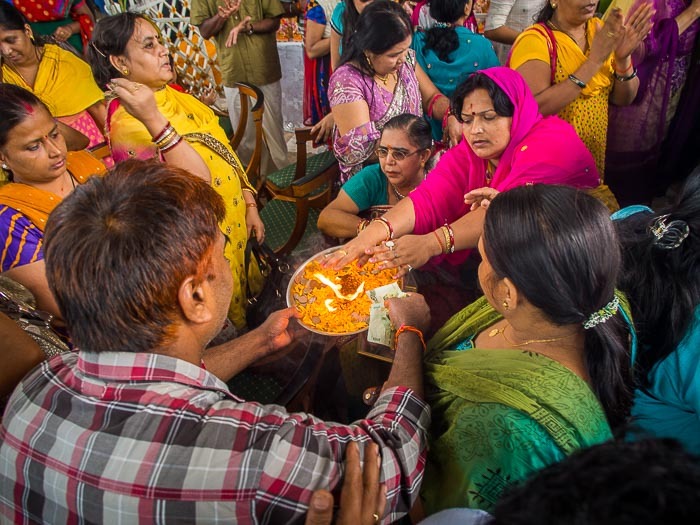 Hindus celebrated their traditions in one part of the temple. Hindu priests blessed people at shrines to Ganesh while Theravada Buddhist monks performed their own blessings nearby. There was a battle of the mor lam bands in the parking lots of the temple, while Chinese Lion Dancers (from the Mahayana Buddhist tradition) worked the crowd soliciting donations. At the same time, in the center of the temple, a Buddhist monk was blessing statues of Ganesh, the Hindu overcomer of obstacles. All of this was going on at the same time, and everyone had turned the volume up to 11. It was sensory overload. Ganesh statues wait to be blessed. When services at the temple ended a large statue of Ganesh was loaded onto a truck and driven to a nearby river for the submersion of the deity. I walked the four kilometers to the river with the crowd. It was a boisterous parade with a soundtrack that was part traditional Hindu music and mor lam. 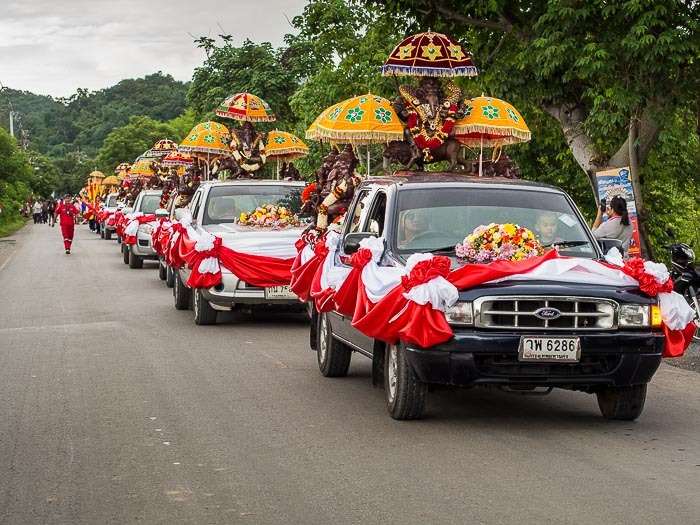 Pickup trucks carry statues of Ganesh to the river. 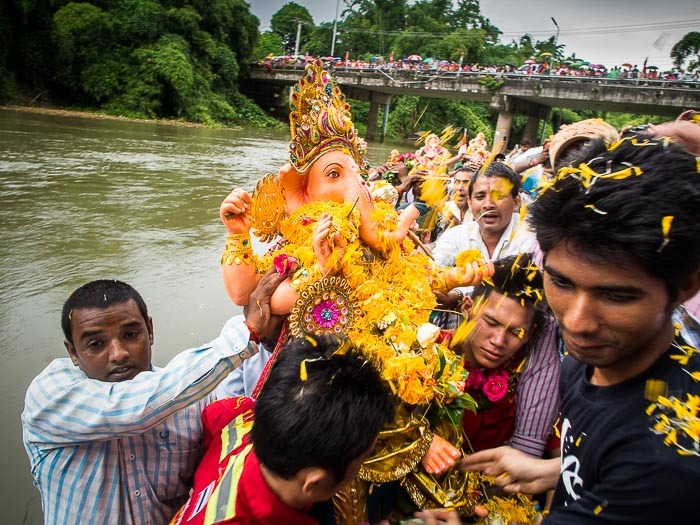 At the river, statues of Ganesh were carried down to the river and gently submerged. The crowds was overwhelming - everyone wanted to touch Ganesh before he slipped underwater. There are more photos of Ganesh Utsav in my archive or available from ZUMA Press.